What do you make yourself for lunch? I make some variation on this salad for my own lunch at least once a week, and it always makes me happy. 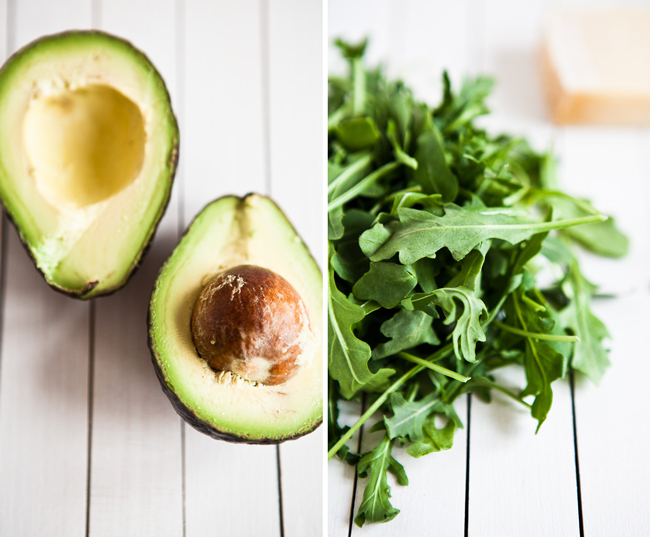 The foundation ingredients are the same: fresh arugula and thinly sliced fennel bulb (preferable from our backyard garden), and avocado. These items - three of my favorites - with a nice dressing can be enough lunch for me. That said, I usually like to layer a few more items in my salad bowl: toasted pine nuts, hazelnuts, or pistachios, and either Parmesan or fresh goat cheese. In winter, kumquats or blood orange are nice additions, and in summer I will add some juicy cherry tomatoes. 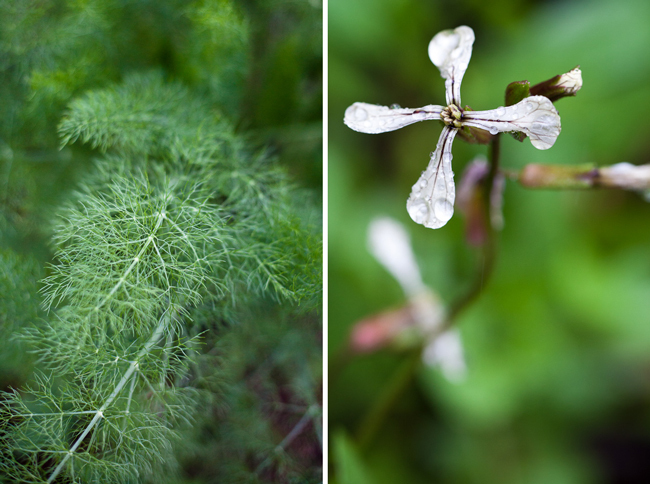 If I can, I throw in a few fennel or arugula blossoms from the garden. The layers of flavor and texture in this salad are not only beautiful to look at, they are deeply satisfying: you get peppery, crisp, creamy, salty, and crunchy bites all in one dish! First, make your dressing. Scoop the Dijon into a 16 ounce Mason Jar, giving you plenty of room for whisking the dressing. 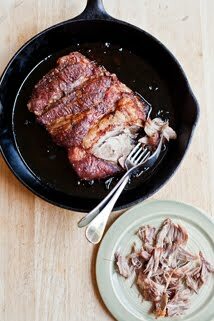 Pour in 2 tablespoons of vinegar and a pinch of nice salt. 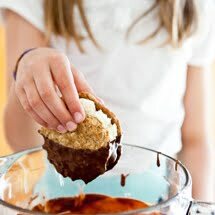 Use a fork or small whisk to fully incorporate the ingredients. This next part is essential to a successful dressing: whisk vigorously and continually as you slowly drizzle your olive oil into the jar. Stop periodically to make sure the oil is emulsifying, giving it a few extra whisks before you continue drizzling in the oil. You will end up with a really nice creamy dressing for your salad. Taste and add more salt if you need it. Set aside. You will have leftover dressing for later use - always a nice thing to have on hand. Wash and thoroughly dry your arugula. Scatter even amounts of greens onto two pretty plates or low bowls. Using a mandolin, if you've got one, slice the fennel bulb into thin rounds. Scatter fennel slivers over the arugula. Next layer on the avocado slices. Then sprinkle on the Marcona almonds. Finally, using a vegetable peeler, shave thick pieces of Parmesan over the salads. Drizzle a tablespoon or two of dressing onto each salad and give a few grinds of the pepper mill. Emma, I am so honored that you were checking for a post. Sorry to have been away for a bit. Not sure how this year has been rolling by so quickly. The weeks are just flying! Erin - now this salad is right up my alley! Those are some of my most favorite things too. Especially the marcona almonds. Sounds like you have an amazing backyard garden - wish I had a green thumb, but I do not. That is where Whole Foods and/or Trader Joe's is amazing. Love your photos. Have a great week!! What a great combination and salad! Those are some of my favorite things. Great flavors. That is one of my favorite types of dressing! Sharp and savory yum yum. I often make wraps for lunch where I make a salad first, dress it, then wrap it up in a wrap. This one would be good like that! Stephanie, Wraps for lunch... that is a good idea. You could just about anything in there and it would be be good. I'm so impressed with your newspaper column. Congrats! Your garden photos make me yearn for my own! Tomorrow is the first day of Spring - I'm so excited for that. I've been putting avocados on everything lately; they were made for salads just like yours. Happy Spring to you, Erin! Happy Spring to you Renee! It is my favorite time of year. All hope and newness. I'm with you about avocados... they make everything good. Marcona almonds add something special to any dish. Heck, I can just eat them plain out of hand, too. Love 'em! A really lovely salad! I usually have a variation of a salad for lunch but sometimes I do struggle for work lunch ideas as I just cannot do sandwiches anymore! This salad would be perfect though! Thanks Anna! Do you ever try legume or rice salads for work lunch? You can pack so many goodies in there and they just seem to get better as the day goes on. We are really trying to expand our salad dressing options. We use Newman's Own but I want to start making our own dressings. I just don't seem to take the time to gather the ingredients and do it properly. Need to slow down and get homemade dressings going. I would love to try the avocado paired with the fennel. I think that would be quite tasty. Sarah, You will never go back once you start making your own dressings. My kids know the drill and they often make our dressing. 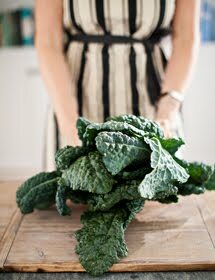 If you make a big jar (2 or even 3 times my recipe here) you will have enough for a few big salads. I hope you'll give this one a try, it's really easey and alwasy a crowd-pleaser. Yum! Marcona almonds are so delicious. I just find even your simplest salad entries inspiring. Thanks for the post! I will lunch with you anytime. I love all three ingredients and thank you for making me think about Marcona almonds. I've never thought of them for a salad. Arugula is so wonderful because it's peppery. I once made a salad with arugula berries and shaved white chocolate. It was a bit different and I could see some Marcona almonds topping it. Wish we could have lunch together too. This is such an interesting salad! I'm crazy for arugula and avocado but I am not terribly familiar with fennel. You've encouraged me to pick one up and start experimenting with it. Thank you! Kate, I'm honored to have inspired you to play around with fennel:) It is one of my favorite ingredient. I love sliced thin in salads but it is also so good roasted/caramelized. Enjoy! This looks like exactly the kind of thing I like to eat for lunch. Anything with avocado gets my vote and although as a bread monster I tend to put similar flavours between two slices of homemade bread, I do love a good salad too! thelittleloaf, Seeing all the beautiful bread you make, I think a sandwich would be my staple too! gorgeous greens! and it sounds incredibly filling. just saw your lovely feature on design sponge. such a beautiful space you have! Thanks Alice! I feel incredibly lucky to have a nice workspace - I love it. And I was so honored by Ginny's nice interview. Always great to hear from you. I am a huge fan of your beautiful work! I just read your interview on Design Sponge and made my way over to your blog. Beautiful photographs! You have made me want to start a collection of spoons and tea towels. That salad looks soo good! I love all the ingredients. And what lovely pictures too! How fun it was to see you featured on Design Sponge, Erin! I do enjoy when my blog worlds cross paths. It's like bumping into a friend in an unexpected place. Now I can add your work space to my inspiration list, along with your recipes and photos. Cheers! I just discovered your blog and wanted to tell you how much I like it! 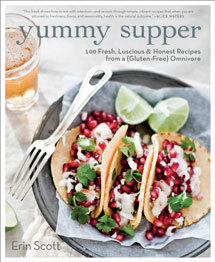 The photos are beautiful and the recipes look delicious. This salad is right up my alley - in fact, I just posted a recipe for a salad that also includes arugula and fennel! Thanks so much Laura! 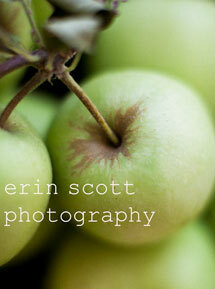 I just checked out your site... great looking salad;) Your blog is beautiful! now this is a beautiful salad! i'd love to dig right into that! I have a fennel bulb in the fridge that I was wondering what to do with. Sliced in a salad sounds great to me. Angela, so glad to be of help;) Fennel seems to make a simple salad just a little more exciting for me. I love the fresh crunch. Lovely! I am into salad at the moment, and this one looks like a winner. I hope you like the salad. Hi Erin! Happy Fennel Friday! 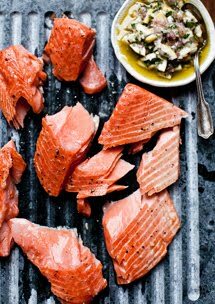 We featured your amazing salad for Fennel Friday Fantastic Salads this week and we are so excited that we found your blog! Happy Spring! The colors, the flavors...they spell out a beautiful mix. Wanna try this really soon! MyFudo, it really is a good combo. I hope you like it too! What a gorgeous salad, I love the flavors. I don't think I eat avocado as often as I'd like to. I'm going to give this a try. You photographs are so beautiful! I haven't been able to get behind raw fennel even though I like that anise flavor. But I think anything that hangs out in a salad with buttery avocado and buttery Marcona almonds can instantly win me over. 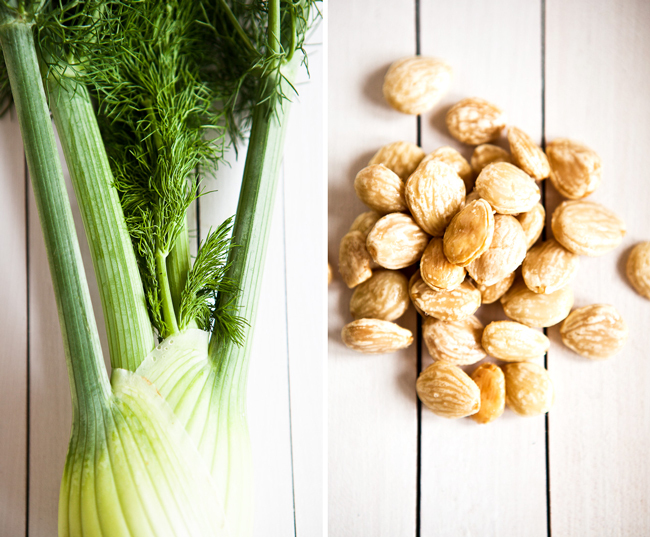 Putting fennel on my list right now for the farmers' market. Thank you for the beautiful inspiration! I don't have the luxury of making lunch for myself during the week, which is probably why my main productions are weeknight dinners, to compensate. Avocado is, unfortunately, not a local product here in NYC -- and in any event, the most flavorful ones tend to be in the summer -- which seems an eternity at this point in time. I'll keep this in mind when July rolls around, when wild fennel is sure to pop up at our Greenmarkets. Hey Magda, Thanks so much. 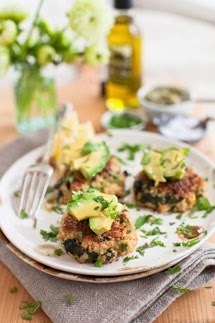 Oooh avocado is one my most beloved ingredients! Lori, I hope fennel is more appealing in salads this time around:) My kids actually love to gnaw on the bulb. A thought...You probably could even forage for wild fennel in your area. There is tons growing wild around here. Spamwise, I know! Sadly avocado is not local to us here in N. Cal either this time of year, but we do get nice organic California avos from down south. 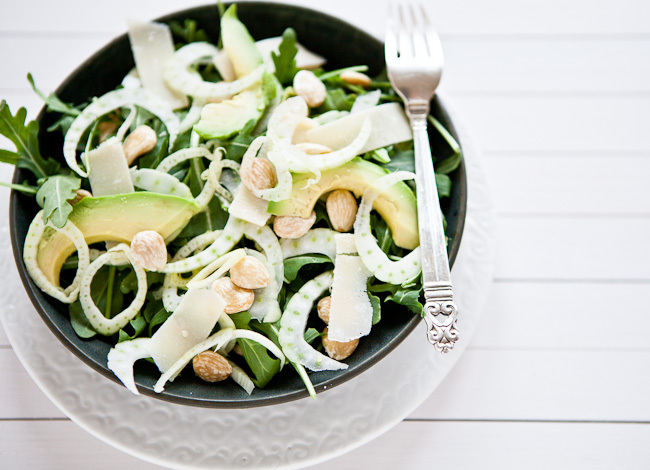 Even without the avocado, the arugula, fennel and marcona almonds make for a really nice salad. I hope you enjoy! Your photos are food for the soul, girl. So beautiful! Leonora! SO nice to hear from you. I'm so glad you liked the salad. I eat a version of this a few times a week. Always makes me happy. Congrats on you nuptials and Portugal? I've always wanted to go. I'm sure you had a great time. Give my best to Jesse and if we ever come your way, we'll be sure to connect.